Myanmar earthquake (August 25, 2016): Today Morning, a strong earthquake hits Italy and now, it is in Myanmar. This Earthquake recorded as the 6.8 Magnitude in the location near Myanmar. The surrounding areas such as Ranchi, West Bengal, Guwahati, Tripura, Assam, Manipur, Nagaland and Arunachal Pradesh are also affected. According to the US Geological Survey (USGS), the earthquake has occurred in the location of Myanmar at the depth of 84.1 km from the sea level. The Minimum distance is recorded as 200.0 km. The Today’s Myanmar Earthquake has occurred at the time 10:34:55.000 UTC (around 04:04 PM IST). 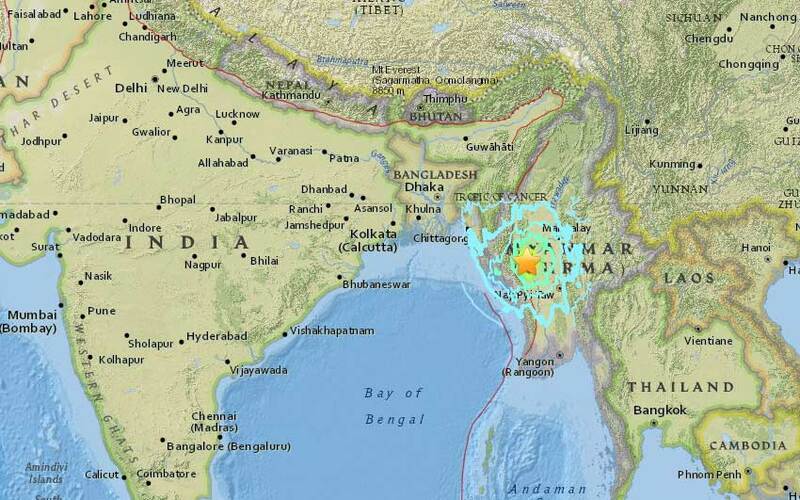 The Tremors are feels in the locations of Bihar, West Bengal, and Assam. All the Metro services are stopped in Kolkata and some offices are closed. A few months back, the same location was affected by the 6.2 Magnitude earthquake on April 14, 2016. Stay tuned in this Space for More information.